Limited time special sign up and receive a month of class and a free t-shirt for only $29! Why join Integrity Martial Arts? Welcome to Integrity Martial Arts in Spokane, Washington! Our martial arts school in Spokane offers first-rate, personalized instruction in Taekwondo, Judo, and Hapkido. Whether you are beginner wanting to learn self-defense, or want to polish your skills as a black belt, we have a martial arts class to help you develop your skills. We currently have a special available for all our new students. For a limited time sign up and receive a month of class and a free t-shirt for only $29! Feel free to stop by and try out a free martial arts class. All of our instructors at our school are experienced, with over 45 years of combined teaching experience and over 55 years of combined self-defense training. Whether you are new to martial arts, or a black belt with many years of experience, we can help you achieve your greatest potential so you can feel confident in your ability to defend yourself. Martial arts classes should be fun, and there’s nothing less fun than contracts, registration fees, and late fees. You don’t have to worry about that with us. We have no contracts, registration fees, or late fees – you just pay month-to-month. If you want you can even come by and try out a free self-defense class. Our tuition is reasonable, too, so you can focus on your training instead of the cost. 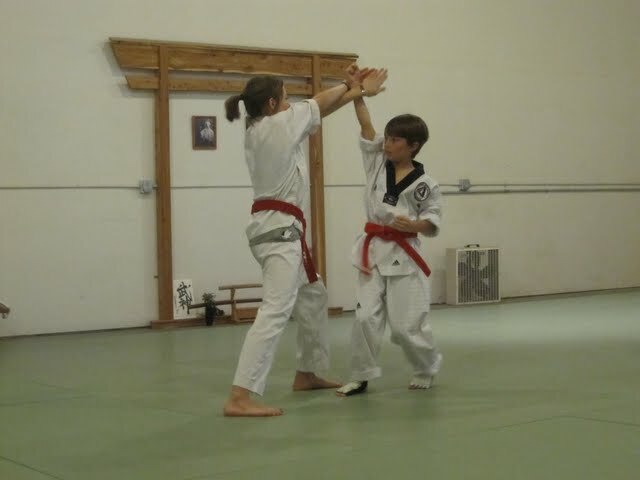 Martial arts lessons are great for building strength, endurance, and coordination in children of all ages. We have classes for children ages 4 and up. Martial arts can also be great physical education for homeschooled kids. We work with the local school districts, such as Mead school district, as well as other school districts in the Spokane area. Through the local school districts we have been able to provide martial arts classes for homeschooled students at no cost to them. One of the elements which makes our school unique in Spokane is that we recognize that every martial art has its strengths and weaknesses in a self-defense situation. That’s why our school teaches a combination of Taekwondo, Judo, and Hapkido. You’ll train towards a Kukkiwon-certified black belt in Taekwondo, while also learning the basics of Judo and Hapkido so you can defend yourself from a distance, in close, or on the ground. A striking martial art from Korea. Taekwondo focuses on kicks, the human body’s most powerful weapon, as well as arm techniques like punches and blocks. Since a fast, powerful kick can damage an opponent even if they block the kick, Taekwondo also focuses heavily on footwork and being able to evade the attack altogether and blocking an attack if the attack is unavoidable. Originating from Japan, Judo uses throws and sweeps to bring the opponent to the ground in a vulnerable position where they can easily be submitted. Since throwing or sweeping your adversary can be a huge advantage, Judo also focuses on maintaining your balance to avoid a sweep or throw. Hapkido which comes from Korea, utilizes joint locks in a circular fashion on an attacker, avoiding the use of strength to control the opponent. Although, Hapkido specializes in joint locks, Hapkido also works on kicks and strikes that are similar to the techniques found in Taekwondo and Karate to aid their practitioner in a self-defense situation. When people think about martial arts, they tend to think about the flashy moves they see in movies, or fighting in a self-defense situation. Our martial arts school in Spokane concentrates more on self-defense than flashy moves, but the physical training in that you receive is only half the training. In order to be a true martial artist, you must have good values that will help you and your classmates grow and improve. At Integrity Martial Arts we believe in not only teaching Taekwondo, Judo, and Hapkido, but also teaching our students the core values that every martial arts student should have. Part of martial arts training is about avoiding conflict and using the self-defense techniques that they learned as a last resort. Also, in order to succeed in training one must have a positive attitude and be kind and courteous to one’s classmates. To keep a good self-defense training atmosphere we encourage our students to think about our five core values. Being honest and a person of your word. Being modest and humble throughout your life. Controlling yourself in all circumstances, no matter what situation arises. Keep trying even though things are not always easy. Showing consideration to people including your parents, instructors and the dojang. Interested in signing up? Come watch one of our self-defense classes in Spokane, or try out a class for free!